This is a project forming the second part of the ‘Uncovered’ series. First was ‘Politics Uncovered’, encouraging engagement with the basics on government and parliament. 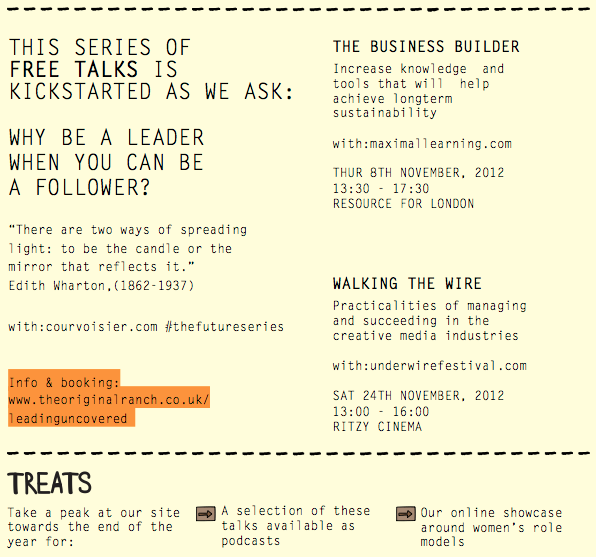 Now, The Original Ranch is looking at women leaders in the creative industries, how they work and what motivates them. It’s a result of real conversations we’ve been having; women come to ask our advice on these issues and so as a consultancy, we want to be able to inform and enable. One of our interests is in how mentoring and role models can make impact in the working world and beyond. It’s also a topical subject, and so we’re joining the debate. A selection of the talks can be heard on our resources page.